It seems like the media is always talking about the environment and how to better serve it; for good reason. We’re blessed to live on such a beautiful planet and thus protecting it is of the utmost importance! When you travel with us, you know we’re all supporting this great cause. From an environmental perspective, our initiatives extend from our company offices to our tours. A local green energy provider powers our head office and stores, we encourage cleaner transportation methods for staff, and we purchase all supplies from a local green business supplier. Your tour leader will provide you with information about local environmental issues and provide suggestions of how we can best protect the local environment. Low Impact Transportation: This trip gives you the chance to master India’s train system from sitting in a seat, to overnighting in a sleeper car and experiencing the famous World Heritage toy trains of Darjeeling. Local transportation allows you to experience the culture on a deeper level! On this trip you might opt to take a walking tour of Delhi guided by one of our Planeterra-supported former street kids. In Jaipur, choose to visit local artisans in a nearby village or in Udaipur, take a cooking class. Included in this trip, in Kalimpong, you’ll learn how to cook some delicious local cuisine and then enjoy it with a family. 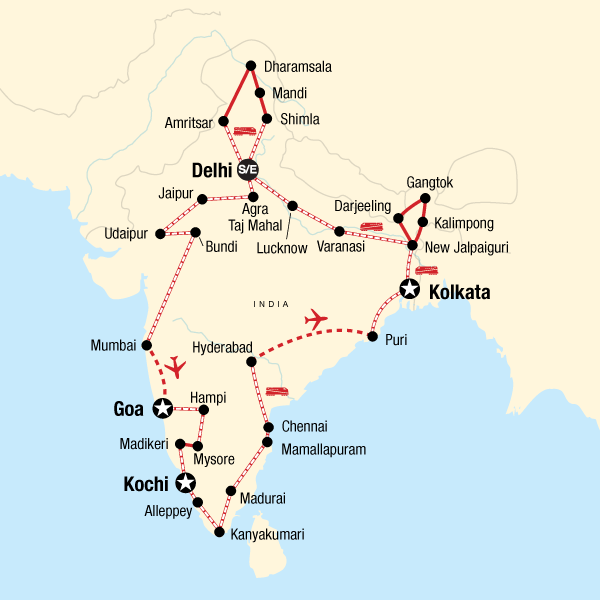 You’ll also experience the Darjeeling toy train and visit a few World Heritage Sites such as the Group of Monuments at Pattadakal, the Sun Temple at Konarak, Jantar Mantar in Jaipur, Agra Fort, Taj Mahal, the Darjeeling and Nilgiri Mountain Railways, Mumbai’s Chhatrapati Shivaji Terminus (historic train station) and Elephanta Caves, the Western Ghats and Mamallapuram’s Shore Temple. You definitely have a plethora of options on this trip, which help you support India’s community. Perhaps also, you might consider booking your airport arrival transfer with us. All of our airport arrival transfers in Delhi support our Planeterra, Women on Wheels project, an airport transfer service driven by women who were previously marginalized, underserved, and underprivileged. It’s a fantastic way to begin your trip!